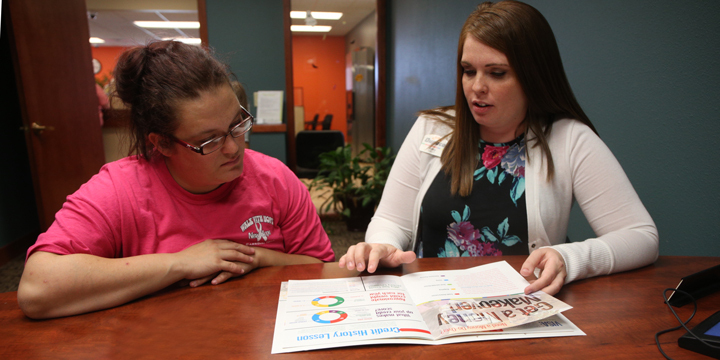 Dupaco’s Amy Meyer (right) visits with member Felicia Ziegmann on Sept. 24 at Dupaco’s branch in Carroll, Iowa. After Ziegmann became a victim of identity theft, Dupaco quickly stopped the fraudulent check and provided unexpected financial guidance. What began as a stressful case of identity theft ended with swift action by her credit union—and unexpected guidance to work toward a brighter financial future. Earlier this year, Dupaco member Felicia Ziegmann, of Carroll, thought she was applying for an online loan with a legitimate company. She would later find out that the information she had provided online had been stolen and used to create a counterfeit check to steal money from her Dupaco checking account. Dupaco quickly flagged the check as fraudulent. But the financial cooperative didn’t stop there. Dupaco’s Amy Meyer offered to help Ziegmann review her financial picture, looking at her budget, loans and insurance. Meyer helped Ziegmann consolidate a couple of loans and credit card debt, which reduced her monthly payments by $225. Next, Meyer set up a separate rent account for Ziegmann so she could automatically and systematically set aside money with every paycheck to go toward her rent payments. MORE: Is debt consolidation right for you? Ziegmann says this was the first time she had ever reviewed her entire budget like this—and found the process to be easier than she had imagined. Meyer also put Ziegmann in touch with Dupaco Insurance Services. By moving her auto insurance to Dupaco, Ziegmann was able to reduce her insurance premiums. The savings even included something Ziegmann didn’t have before: renter’s insurance.